Reducing the number of columns to increase open plan areas and increase flexibility for re-use is often important in commercial buildings. Prestressing the concrete is a tried and tested method that can deliver these longer spans. Information on prestressed concrete can be found in the Post-tensioned (PT) slabs section and the publication Post-tensioned Concrete Floors. Mechanical and electrical services are an expensive and programme-critical element in construction, with significant maintenance and replacement issues. The soffit of a concrete flat slab provides a zone for services distribution free of any downstand beams. This reduces design team coordination effort and risk of errors. It allows flexibility in design and adaptability in use. A flat soffit permits maximum off site fabrication of services, higher-quality work and quicker installation. M&E contractors quote an additional cost of horizontal services distribution below a profiled soffit with downstand beams of up to 15 per cent. Openings in the slab for service risers can be accommodated simply during design, and formed during casting, or cut later to suit. For the longest spans, band beams, which are wide shallow beams, provide large areas uninterrupted by secondary beams and the freedom to route ducts under the shallow main beams. A concrete structure has a high thermal mass. Exposed soffits allow fabric energy storage (FES), regulating temperature swings. This can reduce initial plant costs and ongoing operational costs, while converting plant space to usable space. With the outlook of increasingly hot summers, it makes sense to choose a material that reduces the requirement for energy intensive, high maintenance air-conditioning. More information on thermal mass can be found in the Publications Library. Sealing and fire stopping at partition heads is simplest with flat soffits. Significant savings of up to 10 per cent of the partitions package can be made compared to the equivalent dry lining package abutting a profiled soffit with downstands. This can represent up to four per cent of the frame cost, and a significant reduction in programme length. Concrete offers a whole range of options for meeting the requirements of a particular project. The options outlined below are the most popular for commercial buildings. More information on concrete frame solutions can be found in the concrete frames section and the publication Economic Concrete Frame Elements. Hybrid concrete construction (HCC) makes use of precast and in-situ concrete together, combining the benefits of both to give a robust, durable construction which is fast on site, with an excellent finish. There are many different forms of HCC but a popular option for commercial buildings is to use hollowcore units, which are prestressed to maximise the floor span. For very long span situations (greater than 12m) a post-tensioned band beam offers are economic solution. Band beams are shallow, wide beams that minimise the overall structural depth. The pre-stressing maximises the performance of the concrete and controls deflection. An independent cost study for office buildings has been carried out by a team comprising Allies and Morrison, Arup, Davis Langdon and Mace. Six short-span structural options, 9.0 x 7.5m grid, and two long span options, 15.0 x 9.0m grid, were fully priced, with the costings based on detailed plans and structural solutions. The study found that a flat slab was the most economic solution and that as well as comparing the cost of the structural frame, the benefits discussed above should be included in the cost comparison because they can reduce costs for other elements of the building. 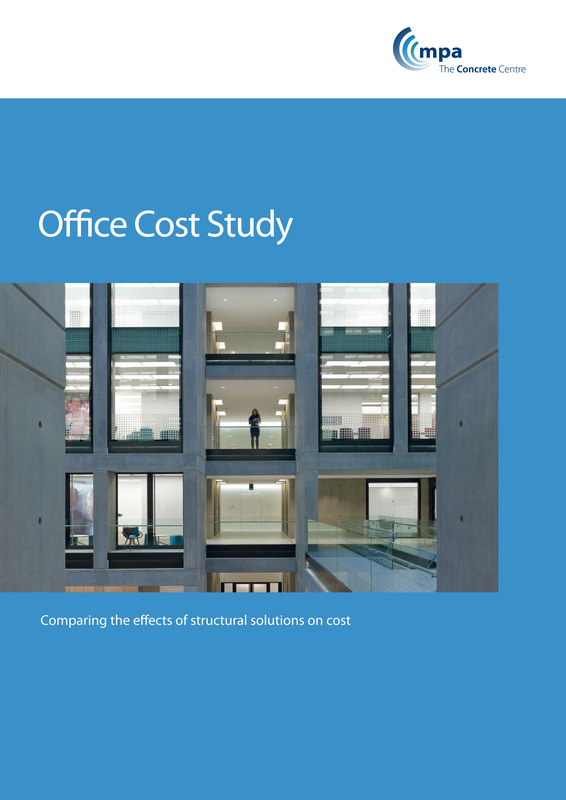 For more information on the study visit the Publications Library to download the Office Cost Study publication, or the more detailed Cost Model Study - Commercial Buildings.